The last post was about Noodles. This one is about Nasi Padang. 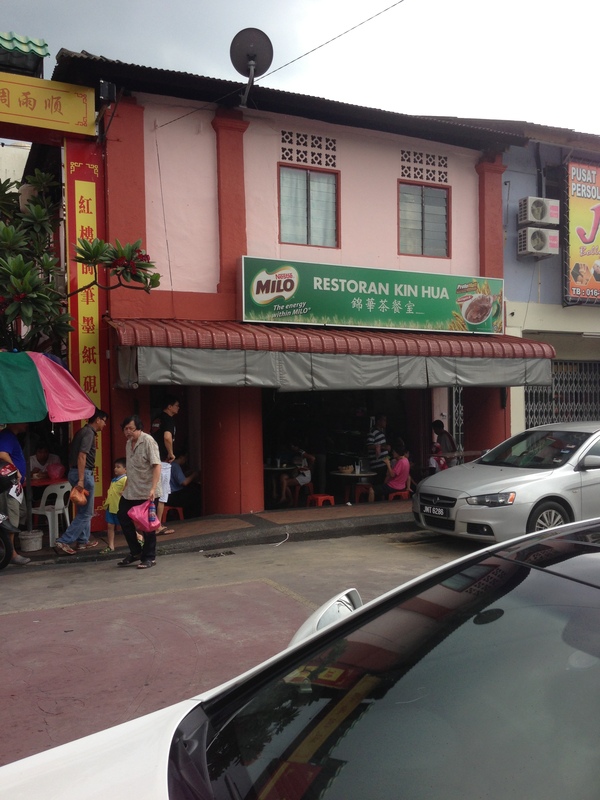 Right down the street from Sang Heng, on the corner. It’s packed, crowded, but the Nasi Padang is real nice. There is a small area where you get your food. So how does it work? You head to the lady who is scooping the rice. You tell her how much rice you want, one bowl, two bowls, etc. And she will scoop it out for you. Then you head down the line and take whatever you want. Take a look at the selections that they have and you scoop away to your basket of rice. Once you have finished taking all your side dishes and gravies, you head to the cashier and then the aunty will look at what you have and calculate the price. 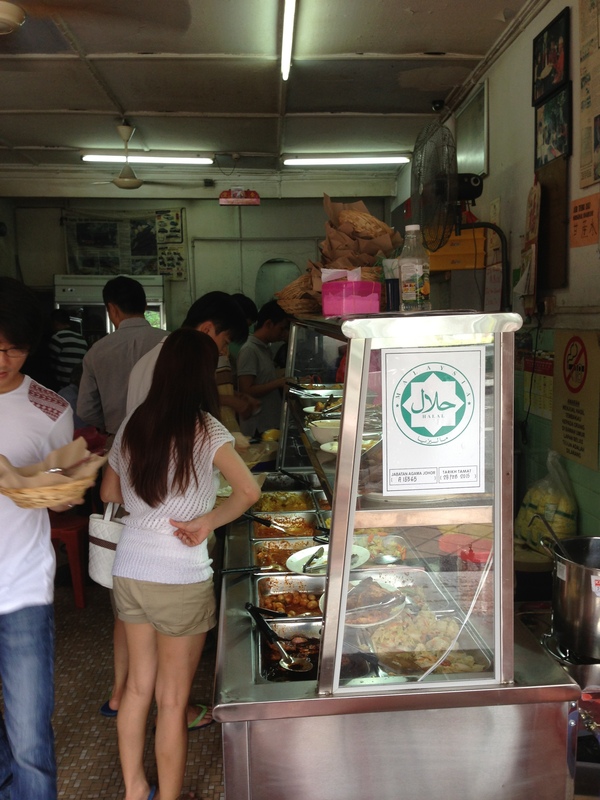 You pay and then you makan! So how did I do? From the top and moving clockwise, there is an egg omelette with some vegetables, then a fried sunnyside egg, but the yolk is cooked. Next are lady fingers, then a light curry chicken, to the left of that is a small piece of assam chicken, and then finally a piece of fried chicken. In the middle is light curry on the rice, the top is an assam curry. All of this for the nice sum of 9RM. The taste is great, there is no doubt about it. 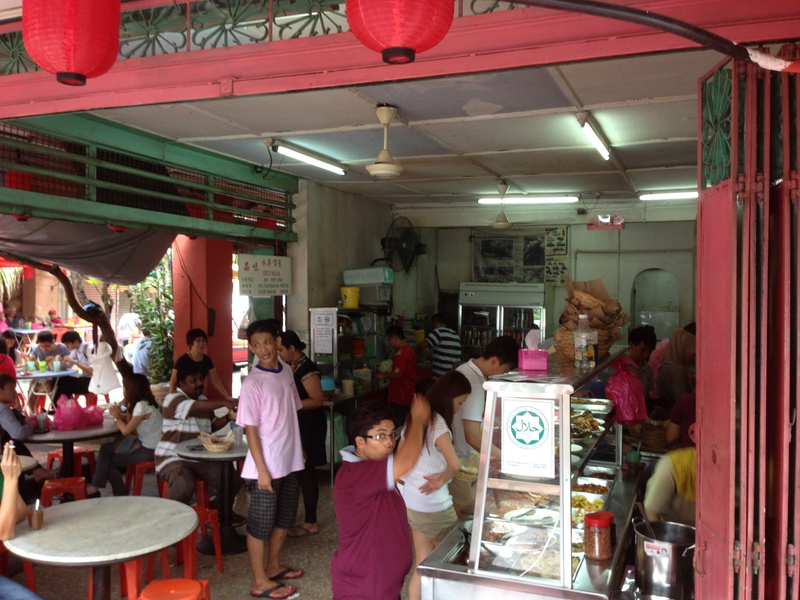 It is just very crowded at lunchtime, so make your way carefully. The other great part are the drink guys who go around taking your drink orders. They only take the orders and deliver the drinks. Then there is another aunty who comes to collect the money afterwards. And she loves to talk. We had a short conversation about where I got my little change bag, in Singapore or JB, and then she wanted directions on how to go to the Daiso to get the bag! Great atmosphere, a lot of fun and the food was real nice. 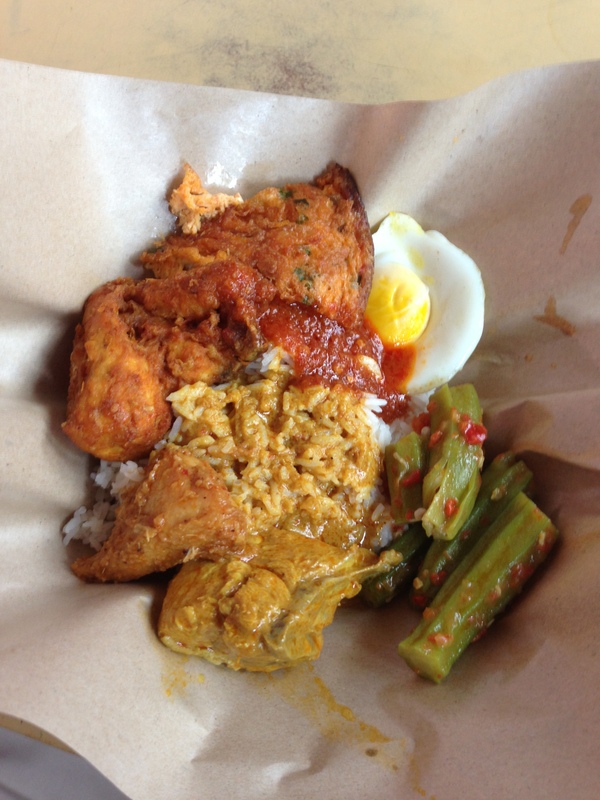 Posted in Johor Bahru, Nasi, Nasi PadangTagged JB, Nasi PadangBookmark the permalink.